We think this is the best Drywall Lifter we have ever sold. 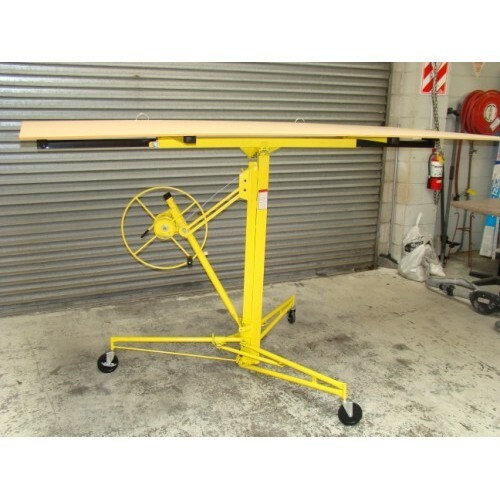 This Dry Wall / Plasterboard Lifter can carry a full size board of total weight 150 lbs/68 Kgs. It is rated to lift to 11ft or 3.35m. This machine is particularly useful when lifting GIB Plasterboard and Panels. Note that the load bed arms will extend to 4 meter so the ternal question of what size sheet it will lift can be shown as 6m...allowing for 1 meter overhang either side...it is more a question of balance. The Lifting mechanism has a safety brake that is spring and friction operated for safety. It is fitted with heavy duty castors for easy and accurate movement and a safety brake to stop movement of the lifter whilst raising panels.Each wheel has a brake mechanism. It has a tilting action to allow for easy loading of the panel. There is also a tilt of about 20 degree side to side. Once loaded the panel can be rotated 360 degrees to allow accurate placement. When the job is done,it collapses easily to fit into a van or ute. Net weight 43 kgs. This lifter is really easy to assemble and disassemble for cartage. The pictured Lifter is the actual product that you will receive,not a generic photo as used by some vendors. Being quite heavy Pick Up is preferred but shipping can be discussed after purchase. The item is packed in a single carton for shipping purposes. Some assembly needed,but full instructions enclosed. Full 12 month warranty (RTB) from date of purchase provided the machine is used only for the purpose for which it was intended,is not abused or used for commercial purposes.